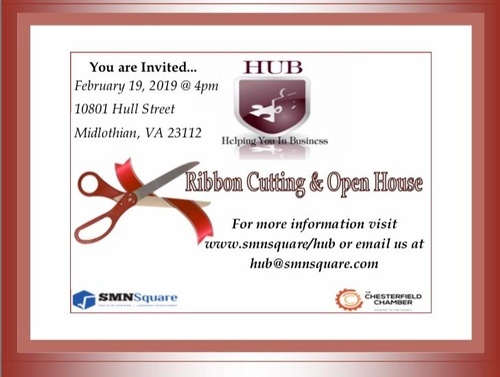 Join HUB for a ribbon cutting of their Midlothian location on Tuesday, February 19 at 4 PM. Following our Ribbon Cutting and Open House feel free to stay behind and join us for our first 1MC after dark. Will Morris, founder of EdConnective, will be discussing his journey as an entrepreneur. According to Morris, "EdConnective helps school leaders get coaching for teachers when they don't have the time, funds,or staff. Our mission is to help teachers move from good to great so that every student has accessto a highly effective teacher AND every teacher has access to a highly effective coach. 1 Million Cups is a great national program of the Ewing Marion Kauffman Foundation, and we at RVA Works have been pleased to bring this program to Richmond. Since 2014 we have held almost 200 unique networking events for entrepreneurs. This is a setting in which business founders come to connect, inspire and educate one another. Each week an entrepreneur provides their business model and growth plans, and they benefit from questions and peer recommendations. Other founders in the audience refine their ideas, build their team, and develop local sales.